My voice is raspy. My eyelids are heavy. My clothes are still in a pile by my bed. And I still have to find my slippers. Yet, my heart is full, my memories wonderful and my mind is a big mumble jumble of pressure drop, happiness and everything that is good and wonderful. Clare and I held our first 3 day workshop together this passed weekend and I still have to process it all. To say we had a great time would not do it justice. We met one of the most wonderful group of women we had had the chance to instruct in everything food photography related. One word that I have used so far to describe the workshop and this weekend is "generosity". I will go back to that when I post more about the workshop in the next couple of days. As I mentioned, I still have to process the emotions and thoughts of this weekend. All wonderful. All making me completely aware that I am doing what I am supposed to be doing. What I have set out to do and giving it my all everyday. Food photography allowed me to become my own. It is my responsibility to nurture that path. For Clare and myself, the workshop was both a way to nurture the attendees' interest and skills in food photography as it was a way to offer them the time and the place to unwind and focus for a few days. Something we don't always have the opportunity to do in the midst of careers, families, children, etc... We wanted to take care of them. We made them work. We made them laugh. We fed and wined them. One of the lunches we prepared consisted of several salads and quiches. One of them was a variation on the one I am posting here today, a Squash Blossom Quiche with Feta and Basil. Unusual and completely tasty. Squash blossoms are in season here right now and every where at the farmers market these past couple of weeks. I can't get enough of them. Simply chopped and tossed in salads. Slightly grilled and sprinkled with sea salt. Filled and pan fried until crisp. It's a love affair I hate to see end in a few weeks when they will disappear from the stalls. Another love affair of mine lately is with radishes. Watermelon radishes, heirloom French radishes (Jaune D'or radishes), French breakfast radishes, early Scarlet, Sicilian reds, etc... Raw with a sprinkle of salt, roasted with a sprig of rosemary. Or simply dressed with a drizzle of pungent olive oil, celtic salt and freshly ground pepper. I bought many bunches to use during the workshop and they were the perfect peppery or spicy touch to the giant salads that accompanied all our dinners. We are very lucky to have the folks at Lowland Farms grow as many interesting varieties of radishes, greens, kales, etc...with that much care and passion. A simple radish salad was the perfect buttery-peppery partner to the soft and delicate squash blossom quiche. In the bowl of a food processor fitted with a plastic blade, pulse together the flour and salt. Add the cold butter all at once. Pulse until the flour is the size of tiny peas. Drizzle the ice water through the mouth of the food processor, while pulsing. Stop just when the pastry begins to come together. Empty the bowl onto a lightly floured surface and form into a disk using your hands. Wrap with plastic wrap and refrigerate for at least 30 minutes. This can be done up to 2-3 days in advance. You can of course, do the whole thing by hand. Once the pastry has rested, preheat the oven to 350F. Roll it out on a lightly floured surface, to about 1/4" thickness. Refrigerate while you prepare the filling. In a food processor, pulse together the eggs, milk, salt, pepper and basil leaves until the basil gives the filling a light green color. By hand, nutmeg and feta. Do not pulse but stir them in with a spoon. Pour at the bottom of the refrigerated pie crust and top with the squash blossoms in a circle all around the filling. Bake for 45 minutes to an hour until the quiche is golden brown. Let cool slightly before eating. The photos are so perfect! The quiche looks like a Van Gogh painting. Thank you for your grat work! Did you leave the little squash nub on in the quiche? Or do you cut it off for another purpose? Morgan: I only used the blossom. Your photos are absolutely breath taking and beautiful, so inspiring! Squash blossoms are soooo gorgeous. They sell them at the farmers markets here in San Diego and I rarely buy them but should...just to take pics of them even...they just photograph so wonderfully I think. Your recipes and pics, as always...stunning! Where do I begin to tell you how much this weekend meant to me? You can Clare completely changed the way I see & photograph food. Thank you for sharing yourself and your gift. Thank you so much for sharing your recipe. The quiche you made for us with delicious! And your description of the workshop was perfect - it definitely nurtured my interest and skills and was the perfect place to unwind and focus! You pictures are so pretty. What a lovely post recapping what I"m sure was a fantastic workshop, brimful of positivity, talent, generosity and experience... Hope to join one someday soon...Congratulations! Where I come from in India... we coat the squash blossoms in a rice paste spiced with turmeric and a wee bit of red chillies and salt and then fry them!!! Yum!!! Your photographs...ahhh... each time.. i look on in wonder!! Amazing! I look forward to each post. Beautiful! 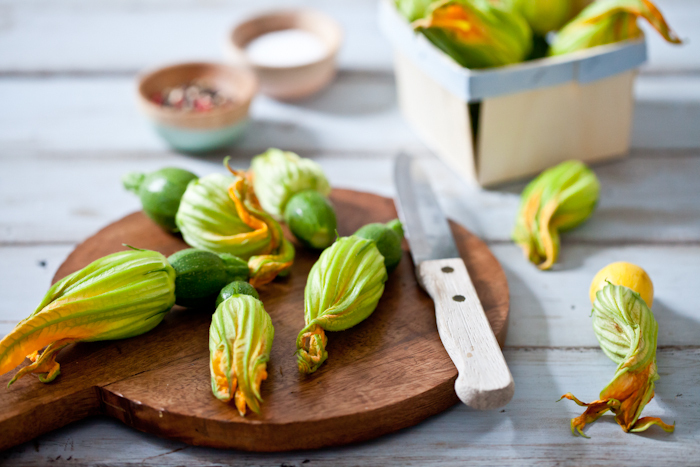 I can't wait to try this when my zucchini plant is blossoming. I love these pictures, they really bring a touch of summer (weather in Belgium is rainy and still pretty cold for the time of the year). I would love to attend one of your workshops one day, any plans to organize one in France? The quiche looks so picture perfect! Looks quite delicious! I love a nice quiche with feta! I was reflecting about those four days last night... I concluded the workshop was as much about learning as it was about inspiration, thank you so much for opening up such a marvelous space for us to learn and share! Your recipes are always delectable and your photographs inspire me every day to try new things. 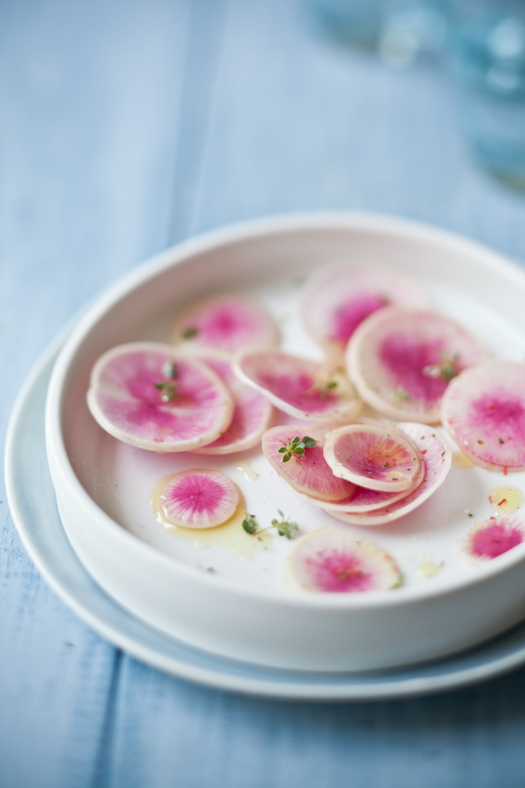 I've never had radishes before, and I'm itching to taste them! I have to get to a farmers market pronto. Beautiful! Thank you again for an inspiring weekend. I just saw some squash blossoms in my garden. Now is the time to pin this recipe. One day I would love to take one of your workshops. just gorgeous! Squash blossoms make Spring taste so much better :-) And I agree about the radishes, have been obsessed with them lately as well! Beautiful! Are those the same as the zucchini blossoms? That looks amazing. I haven't come across squash blossoms around here yet, but I will have to keep my eye out!